This visual handheld spectroscope is a 115mm long tube with a very precise entrance slit which provides a very good resolution for such product. 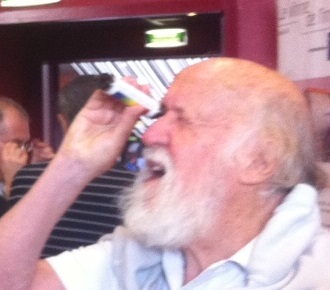 Hubert Reeves, a famous professional astronomer, watching through our handheld spectroscope ! Spectra of our Sun and of an energy-saving lamp. Handheld picture taken with a simple digital camera. Large diameter eyepiece aperture facilitates comfortable viewing of the SINGLE, LARGE and BRIGHT SPECTRUM which is CENTRALLY PLACED in the field of view. 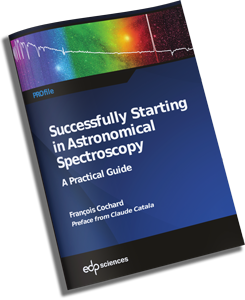 high quality optical components ensure that absorption bands show up clearly – even weak bands that are sometimes difficult to detect. 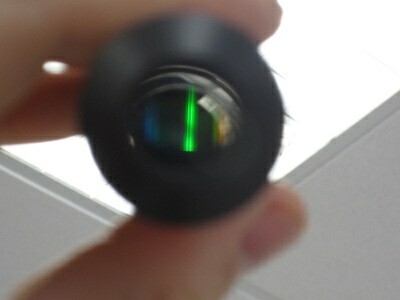 The LINEAR SPECTRUM is generated by a particularly bright transmission diffraction grating of 600 lines/mm. The unit is of fixed construction – no need for adjustment. Robust assembly to withstand years of student handling. Convenient size, 115mm x 25mm. Supplied in protective rigid box. This handheld spectroscope is ideal to use in classroom, during scientifical public outreach or simply for you to look at street lamp differently!